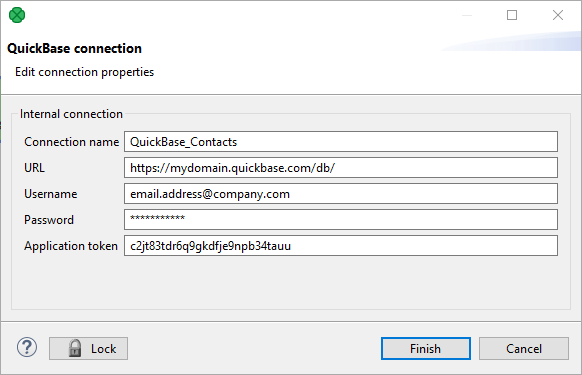 To work with a QuickBase database, use the QuickBase connection wizard to define connection parameters first. Give a name to the connection (Connection name) and select the proper URL. By default, your QuickBase database allows only SSL access via API. As the Username, fill in the Email Address or the Screen Name of your QuickBase User Profile. The required Password relates to the user account. Application token is a string of characters that can be created and assigned to the database. Tokens make it all but impossible for an unauthorized person to connect to your database.